Streaming media is certainly a new technology that has made watching TV shows and movies so convenient. No longer do you have to physically go to a store to buy or rent a DVD. Now, you can buy or rent movies, TV shows, music and books from the comfort of our own homes and within a matter of minutes by purchasing them online and playing them on laptops or tablets. No more fussing around with a DVD player that takes up a lot of space and is difficult to configure. However, watching a movie on your laptop or tablet is only preferable when you are on the go and by yourself. When you are at home and the entire family wants to relax and watch the movie that you have purchased from an online vendor, it’s not a very comfortable viewing experience when you all have to crowd around a laptop. A solution to this would be to hook your laptop or tablet up to your television, but more often than not, the journey from your laptop to your television is too much for the media and you end up with lower quality. To support the convenient and growing streaming media market while ensuring that you have a flawless at-home screening of that TV show or movie, DisplayLink has developed a solution. 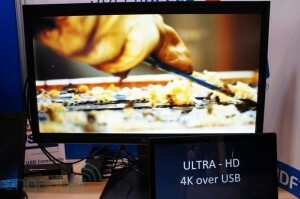 The new DisplayLink adapter was featured at Intel Developer Forum San Francisco 2013 (IDF13) and, through dynamic data compression, consists of a chip which is capable of transmitting 4K ‘Ultra HD’ (3840×2160) video through USB 2.0 and USB 3.0. Especially when you are viewing a 4K video through USB 3.0, the viewing is very smooth – just like it would be when you are watching on your laptop or tablet. Additionally, this new chip is able to send 4K and 1080p content over a wireless network (the 1080p functions over Wi-Fi 802.11ac and the 4K functions over 802.11ad). The USB 2.0 operates at a more modest capacity, dropping frames due to lower bandwidth, but it is still functional. DisplayLink is still in the process of perfecting this device so a price has not been determined, but it will be available for purchase on the DisplayLink website and sites and stores where DisplayLink currently features its many items. As one of the notable companies in the USB peripherals market, it can be certain that this device will continue to uphold the strong reputation of DisplayLink. This entry was posted in Articles and tagged 1080p, DisplayLink, high definition, intel developer forum, Video, Wireless. Bookmark the permalink.